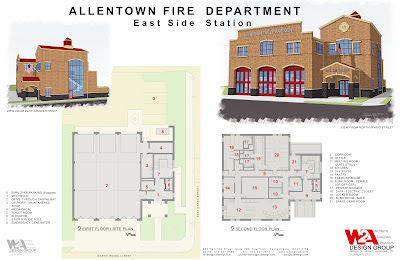 W2A Design Group is proud to have joined City officials last evening when the final design of the new East Side Fire Station was presented to the East Side Rittersville Neighborhood Association. Mayor Ed Pawlowski, Fire Chief Robert Scheirer, Richard Young, Director of Public Works, Don Hoegg, Facility Manager, Building Maintenance, and Joseph Davis, the East Side’s newest City Councilman, were in attendance. The group was overwhelmingly supportive of W2A Design Group's design, complimentary of its “traditional yet modern” style, adding that the building will be a great addition to their neighborhood. Demolition of the existing building will be complete in June, and the construction project is anticipated to go out to public bid in July. The display boards will be on display in the Fire Administration office.